MR NAND adapter for eMMC / eMCP memory - MR TYPE 12 (Hynix BGA162) is high quality special adapter for eMMC flash memory using NAND protocol without soldering. 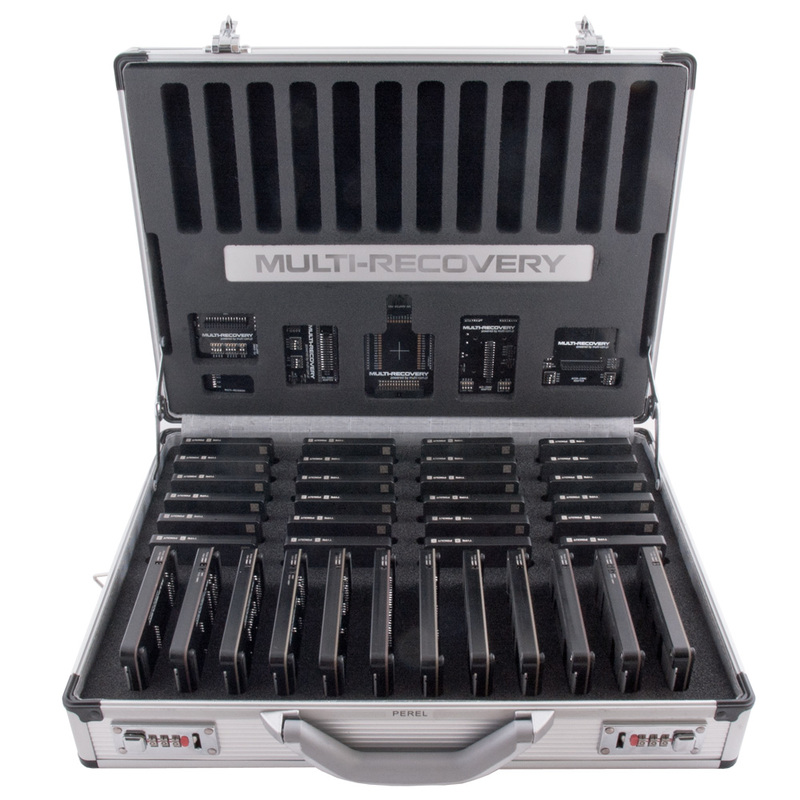 The MR adapter is compatible with devices such as Visual NAND Reconstructor VNR (Rusolut), Flash Extractor (Soft Center) and PC3000 Flash (Ace Laboratory). The adapter replaces the need for any soldering to the card for reading and, thanks to unique solutions, it also provides quick analysis and configuration other pinouts using a logic analyzer. Use of the adapter minimizes the risk of flash chip damage by soldering (ie pad breaking) and instantly reading using various NAND programmers. MR NAND adapter for eMMC / eMCP memory - MR TYPE 13 (Micron BGA221) is high quality special adapter for eMMC flash memory using NAND protocol without soldering. The MR adapter is compatible with devices such as Visual NAND Reconstructor VNR (Rusolut), Flash Extractor (Soft Center) and PC3000 Flash (Ace Laboratory). 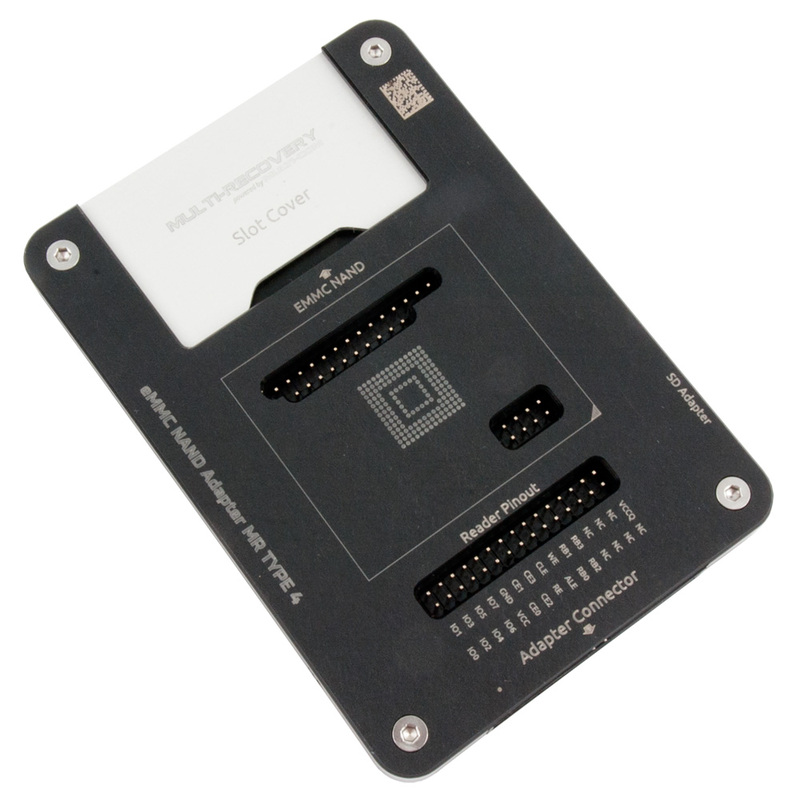 The adapter replaces the need for any soldering to the card for reading and, thanks to unique solutions, it also provides quick analysis and configuration other pinouts using a logic analyzer. Use of the adapter minimizes the risk of flash chip damage by soldering (ie pad breaking) and instantly reading using various NAND programmers. MR NAND adapter for eMMC / eMCP memory - MR TYPE 6 (Hynix BGA221) is high quality special adapter for eMMC flash memory using NAND protocol without soldering. The MR adapter is compatible with devices such as Visual NAND Reconstructor VNR (Rusolut), Flash Extractor (Soft Center) and PC3000 Flash (Ace Laboratory). The adapter replaces the need for any soldering to the card for reading and, thanks to unique solutions, it also provides quick analysis and configuration other pinouts using a logic analyzer. Use of the adapter minimizes the risk of flash chip damage by soldering (ie pad breaking) and instantly reading using various NAND programmers. MR NAND adapter for eMMC / eMCP memory - MR TYPE 9 (Samsung BGA221) is high quality special adapter for eMMC flash memory using NAND protocol without soldering. The MR adapter is compatible with devices such as Visual NAND Reconstructor VNR (Rusolut), Flash Extractor (Soft Center) and PC3000 Flash (Ace Laboratory). The adapter replaces the need for any soldering to the card for reading and, thanks to unique solutions, it also provides quick analysis and configuration other pinouts using a logic analyzer. Use of the adapter minimizes the risk of flash chip damage by soldering (ie pad breaking) and instantly reading using various NAND programmers. MR NAND adapter for eMMC memory - MR TYPE 1 (Samsung BGA153) is high quality special adapter for eMMC flash memory using NAND protocol without soldering. The MR adapter is compatible with devices such as Visual NAND Reconstructor VNR (Rusolut), Flash Extractor (Soft Center) and PC3000 Flash (Ace Laboratory). 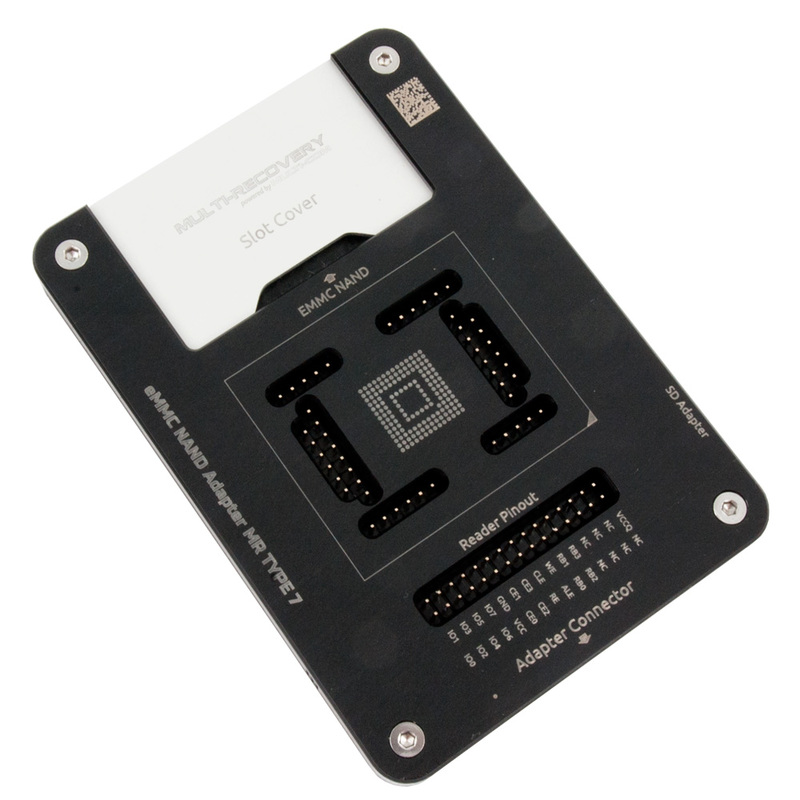 The adapter replaces the need for any soldering to the card for reading and, thanks to unique solutions, it also provides quick analysis and configuration other pinouts using a logic analyzer. Use of the adapter minimizes the risk of flash chip damage by soldering (ie pad breaking) and instantly reading using various NAND programmers. MR NAND adapter for eMMC memory - MR TYPE 10 (Toshiba BGA153) is high quality special adapter for eMMC flash memory using NAND protocol without soldering. The MR adapter is compatible with devices such as Visual NAND Reconstructor VNR (Rusolut), Flash Extractor (Soft Center) and PC3000 Flash (Ace Laboratory). The adapter replaces the need for any soldering to the card for reading and, thanks to unique solutions, it also provides quick analysis and configuration other pinouts using a logic analyzer. Use of the adapter minimizes the risk of flash chip damage by soldering (ie pad breaking) and instantly reading using various NAND programmers. MR NAND adapter for eMMC memory - MR TYPE 11 (Toshiba BGA153/169) is high quality special adapter for eMMC flash memory using NAND protocol without soldering. The MR adapter is compatible with devices such as Visual NAND Reconstructor VNR (Rusolut), Flash Extractor (Soft Center) and PC3000 Flash (Ace Laboratory). 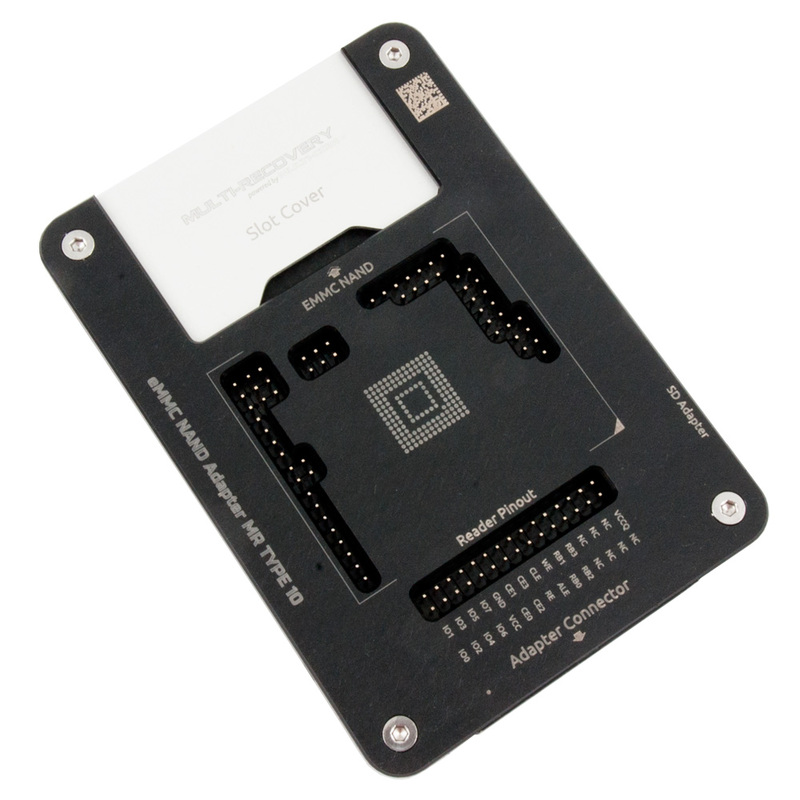 The adapter replaces the need for any soldering to the card for reading and, thanks to unique solutions, it also provides quick analysis and configuration other pinouts using a logic analyzer. Use of the adapter minimizes the risk of flash chip damage by soldering (ie pad breaking) and instantly reading using various NAND programmers. MR NAND adapter for eMMC memory - MR TYPE 2 (Samsung BGA169) is high quality special adapter for eMMC flash memory using NAND protocol without soldering. The MR adapter is compatible with devices such as Visual NAND Reconstructor VNR (Rusolut), Flash Extractor (Soft Center) and PC3000 Flash (Ace Laboratory). The adapter replaces the need for any soldering to the card for reading and, thanks to unique solutions, it also provides quick analysis and configuration other pinouts using a logic analyzer. Use of the adapter minimizes the risk of flash chip damage by soldering (ie pad breaking) and instantly reading using various NAND programmers. MR NAND adapter for eMMC memory - MR TYPE 3 (Samsung BGA153) is high quality special adapter for eMMC flash memory using NAND protocol without soldering. The MR adapter is compatible with devices such as Visual NAND Reconstructor VNR (Rusolut), Flash Extractor (Soft Center) and PC3000 Flash (Ace Laboratory). The adapter replaces the need for any soldering to the card for reading and, thanks to unique solutions, it also provides quick analysis and configuration other pinouts using a logic analyzer. Use of the adapter minimizes the risk of flash chip damage by soldering (ie pad breaking) and instantly reading using various NAND programmers. MR NAND adapter for eMMC memory - MR TYPE 4 (Samsung BGA153) is high quality special adapter for eMMC flash memory using NAND protocol without soldering. The MR adapter is compatible with devices such as Visual NAND Reconstructor VNR (Rusolut), Flash Extractor (Soft Center) and PC3000 Flash (Ace Laboratory). The adapter replaces the need for any soldering to the card for reading and, thanks to unique solutions, it also provides quick analysis and configuration other pinouts using a logic analyzer. Use of the adapter minimizes the risk of flash chip damage by soldering (ie pad breaking) and instantly reading using various NAND programmers. MR NAND adapter for eMMC memory - MR TYPE 5 (Samsung BGA153) is high quality special adapter for eMMC flash memory using NAND protocol without soldering. The MR adapter is compatible with devices such as Visual NAND Reconstructor VNR (Rusolut), Flash Extractor (Soft Center) and PC3000 Flash (Ace Laboratory). The adapter replaces the need for any soldering to the card for reading and, thanks to unique solutions, it also provides quick analysis and configuration other pinouts using a logic analyzer. Use of the adapter minimizes the risk of flash chip damage by soldering (ie pad breaking) and instantly reading using various NAND programmers. 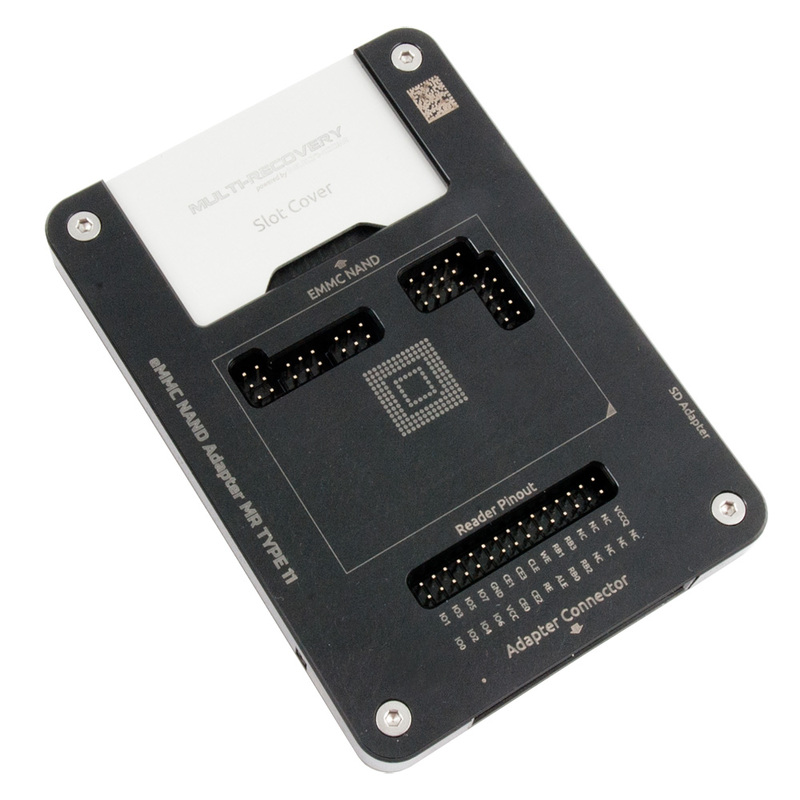 MR NAND adapter for eMMC memory - MR TYPE 7 (Sandisk BGA153) is high quality special adapter for eMMC flash memory using NAND protocol without soldering. The MR adapter is compatible with devices such as Visual NAND Reconstructor VNR (Rusolut), Flash Extractor (Soft Center) and PC3000 Flash (Ace Laboratory). The adapter replaces the need for any soldering to the card for reading and, thanks to unique solutions, it also provides quick analysis and configuration other pinouts using a logic analyzer. Use of the adapter minimizes the risk of flash chip damage by soldering (ie pad breaking) and instantly reading using various NAND programmers. MR NAND adapter for eMMC memory - MR TYPE 8 (Hynix BGA153) is high quality special adapter for eMMC flash memory using NAND protocol without soldering. The MR adapter is compatible with devices such as Visual NAND Reconstructor VNR (Rusolut), Flash Extractor (Soft Center) and PC3000 Flash (Ace Laboratory). The adapter replaces the need for any soldering to the card for reading and, thanks to unique solutions, it also provides quick analysis and configuration other pinouts using a logic analyzer. Use of the adapter minimizes the risk of flash chip damage by soldering (ie pad breaking) and instantly reading using various NAND programmers. Set of 12 MR NAND adapter for eMMC / eMCP memory contains complete set of 12 adapters, 16 rasters and 24 pinouts. High quality special adapters for eMMC flash memory using NAND protocol without soldering. The MR adapter is compatible with devices such as Visual NAND Reconstructor VNR (Rusolut), Flash Extractor (Soft Center) and PC3000 Flash (Ace Laboratory). The adapter replaces the need for any soldering to the card for reading and, thanks to unique solutions, it also provides quick analysis and configuration other pinouts using a logic analyzer. Use of the adapter minimizes the risk of flash chip damage by soldering (ie pad breaking) and instantly reading using various NAND programmers.